During time of extreme cold, extra homeless outreach teams will patrol the streets encouraging homeless people to come indoors and avoid prolonged exposure to the elements amid dangerously cold temperatures. 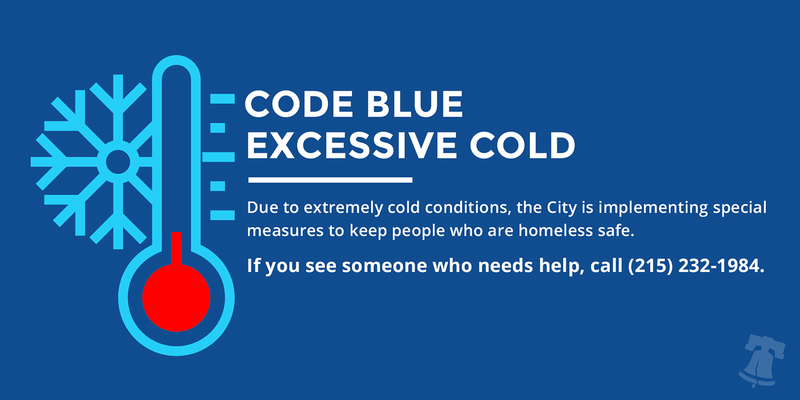 People experiencing homelessness will be strongly encouraged to remain indoors until the Code Blue has ended. OHS is providing 80 extra shelter beds throughout the Code Blue period. 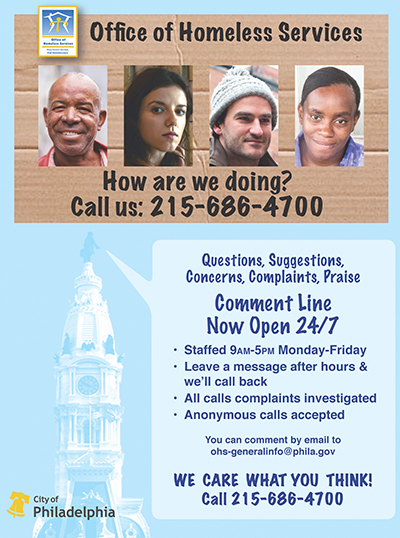 City officials are urging the public to call Homeless Outreach at 215-232-1984 at any time if they see someone who is homeless and sleeping on the street. Homeless outreach teams are available 24 hours a day, seven days a week. OHS issues a Code Blue when the National Weather Service predicts wind chills of 20 degrees or lower or precipitation with temperatures below 32 degrees. The City established a warming center in Kensington. And people came in. People who have been living there, buying, selling and using heroin came in from under the overpasses proving that even in the depths of addiction, the will to live is stronger. Thanks to Pasciencyah Chevalier, Yvette Rodriguez, Renault Harry, Lorraine Obelcz, Joyce Davis, Lauren Tucker and Ronald Rubio. Thanks to Dave Holloman for his leadership throughout and especially during my absence. Over 400 people (not unduplicated) used this and a volunteer-run warming center. Neighbors donated food and bedding, the same neighbors who have been complaining about the people living in the underpasses. OHS deployed a total of 500 beds and café spaces. All the providers went the extra mile to keep people safe and warm. Only three people were turned away and they were able to be accommodated elsewhere. We had just enough space. Thanks to the Housing Services staff and leadership, Fred Gigliotti and Roberta Cancellier for forging a cooperative partnership. Thanks to the Appletree, EARU and Roosevelt Darby staff for being on the front lines throughout. Outreach worked around the clock. They used the opportunity, in partnership with police, to “302” 16 people. Sometimes winter is a good time for people to finally get the services they really need. Even our creaky, leaky old buildings pulled their weight. Throughout the two-week Code Blue, many of our old, old, old buildings had power outages, floods, burst pipes and other problems that threatened our ability to keep people housed. The emergency housing and facilities staff and providers rallied to get these old hulks back on line quickly so that people could stay safe and warm. The City issues emergency warnings in response to the National Weather Service’s prediction of bitter cold with wind chill temperatures at 20 degrees Fahrenheit or below or 32 degrees Fahrenheit with precipitation. It’s a collaboration among the Office of Homeless Services, the Department of Behavioral Health and Intellectual disAbility Services and the Outreach Coordination Center operated by Project HOME. During Code Blue, Homeless Outreach increases staffing and transports homeless persons directly to shelter 24 hours a day. We also engage Unified Dispatch to ensure that all first responders in the city are aware and on alert. Philadelphia Police are authorized to transport the homeless to a shelter. Our collective goal is to prevent weather related deaths among persons experiencing homelessness. This winter, the Office of Homeless Services has added 304 beds and 124 Café slots for Code Blue. Persons experiencing homelessness do not need to present ID to enter Code Blue shelters or cafes from the street. They may remain indoors throughout the entire Code Blue period and are strongly encouraged to do so. While we appreciate the great sense of concern and sympathy Philadelphians express when coming across a person who is experiencing street homelessness during the extreme cold, we graciously ask all citizens to refrain from offering sleeping bags, food, mattresses, tents or similar items during this period. Providing these items can be dangerous as doing so enables and encourages persons living on the street to remain outside during emergency temperatures instead of coming inside where there is refuge from the cold. We encourage Philadelphians to satisfy their instinct to help by supporting an established nonprofit or faith-based homeless services program at any level for which they may be able to contribute or volunteer.